After some steep losses yesterday morning, oil prices managed to revert back to higher levels, with WTI crude losing just 15 cents by closing time. Today, prices are just barely holding on to positive territory. Crude prices are $63.47, up by just 10 cents. Fuel prices are both in negative territory, though working their way higher after losing ground overnight. Diesel prices are $1.9681, down almost a penny from yesterday’s close. Gasoline prices are $1.9722, half a cent lower. Yesterday the EIA released their weekly inventory data, which showed crude oil prices falling more than expected, while refined fuels saw a net inventory draw as well. The surprise draw was generally supportive for prices, though it came with news that U.S. production has risen to record high levels. The draw was likely a result of high crude exports, which surpassed 2 million barrels per day, roughly .6 million per day above last week. Just weeks ago, the first very large crude carrier (VLCC) vessel left port from America, representing the growing infrastructure in the U.S. committed to exports. The “LOOP” in Louisiana is the first port deep enough to handle the massive vessels. A VLCC and another large vessel both left the U.S. this week heading for China, boosting American exports and helping China continue diversifying their crude supply to include American crude. While overall crude inventories fell, Cushing, OK inventories rose by 3.6 million barrels. Remember that Cushing, OK is the delivery point for WTI crude oil, meaning that WTI futures are directly tied to supply and demand in Cushing. 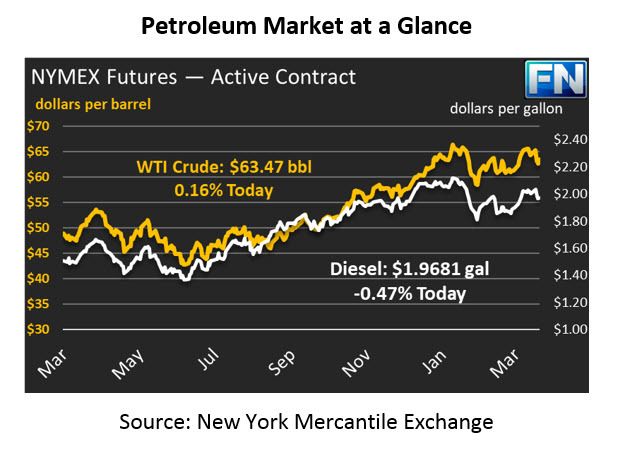 This week, market dynamics changed and made WTI spot prices fall to $4 below WTI futures prices. Over the past year, the difference has not gone past +$1 to -$1.50. The steep discount in current prices incentivizes suppliers to put crude into storage for a month and sell next month when prices are $4 higher. As suppliers flow more oil into storage, stocks will rise, which will put downward pressure on prices. The change in tactic has opened a floodgate of applications, and yesterday the EPA announced that they had approved waivers for 25 small refineries. As an analogy, consider minimum wage laws. Very small companies (making less than $500k per year and not involved in interstate commerce) are not required to pay federal minimum wages. The exemption is meant to provide support for very small companies. Imagine if a major nationwide retail chain opened a small stand that sold less than $500k per year and tried to claim exemption from federal minimum wage laws – it likely would not go over well. The recent policies are the same – large refining companies owning numerous refineries are claiming the exemptions for their small refineries. The impact on actual fuel prices is hard to quantify. The waivers caused RINs prices to plummet – less refineries required to prove blending occurred means less demand for the “vouchers.” The impact on fuel prices is complex – RINs are generally a passthrough cost to consumers, but they do cause ethanol values to fall. Since 10% of gasoline is ethanol, a 40-cent change in ethanol would equate to just a 4-cent change in gasoline prices. The effects are small but could be providing some downward pressure to fuel markets. The larger impact on the fuel supply chain is uncertainty – without clear standards on how much biofuels should be used, fuel suppliers have added guesswork, which can increase downstream risk and costs. Markets buzzed yesterday about a missile strike on a Saudi oil tanker. The missile launch occurred in Yemen by Houthi rebels, known to support the Iranian regime. The attack comes as part of a rising offensive by Houthis against Saudi Arabai, including missile strikes on Saudi’s capital city, Riyadh. While the strike did not cause significant damage to the ship, it does highlight the on-going conflicts globally that could escalate into more severe instability. Earlier this week, Boko Haram attacked a Nigerian army base, further contributing to uncertainty.